Arjen Robben ripped up Wayne Rooney's script, when the Dutchman's sublime late volley swept Bayern Munich into the Champions League semi-finals and Manchester United to European oblivion. Rooney, returning to the heat of battle just eight days after damaging ankle ligaments in his side's 2-1 defeat in the first leg of their quarter-final, flummoxed Bayern by his mere presence as United romped to a 3-0 lead but ultimately his amazing powers of recovery counted for nothing. The England striker, who has scored 34 goals to underpin United's season, was largely a peripheral figure as United scored three goals in the opening 41 minutes against a Bayern side that had completely fluffed their lines amid the tumultuous din of a heaving Old Trafford. He had a hand in Darron Gibson's opener after three minutes but after that it was Antonio Valencia and Nani who tore Bayern to shreds, the latter scoring twice to send United seemingly towards a fourth consecutive semi-final in the competition. That was as good as it got, however, for United, who conceded twice to crash out on the away goals rule -- the second, former Chelsea winger Robben's killer blow, coming after Rooney had trudged off after 55 minutes with more damage to his ankle and Brazilian fullback Rafael had been sent off. Despite the striker not firing on all cylinders, United were full of pace, passion and purpose for most of his 55 minutes. After that, although hampered by going down to 10 men, they retreated into their shells and to such an extent that Robben's knockout blow was hardly a surprise. "I was confident we could score the goal in the second half," Bayern's Dutch coach Louis van Gaal told reporters. "It was incredible to come back from three goals down. The goal from Robben was unbelievable," he added. Ferguson was left to ponder an evening that started full of hope but ended with the worrying prospect of the League Cup, England's least important trophy, being United's only silverware in a season that until last week promised a treble. 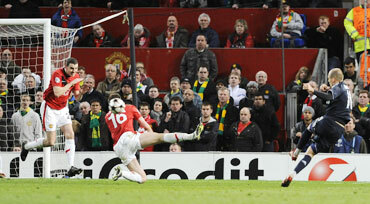 "In one way I could say we threw it away in another I could say we were very unlucky," Ferguson told reporters. "We could have been four or five up at halftime but they scored before the break and it was a crucial blow for them," he added. Seven turbulent minutes was all it took for a rampant United to turn a 2-1 first leg deficit into a 3-2 aggregate advantage at the Theatre of Dreams -- reviving memories of the 7-1 rout of Roma at the same stage three years ago after they had also lost the first leg 2-1. Rooney's most telling touch of the night sent Darron Gibson through to strike United in front after three minutes and Nani's deft back heel from Valencia's cross made it 2-0 as Bayern buckled in an electrifying atmosphere. The visitors looked dead and buried when Nani struck again after 41 minutes with a magnificent shot into the top corner but Croatian Ivica Olic, scorer of the late winner in Munich, grabbed one back two minutes later from a narrow angle to give his side hope at the interval. Five minutes into the second half, Rafael's inexperience resulted in a second yellow card -- the turning point, rather than Rooney's withdrawal soon afterwards, according to an angry Ferguson who pointed the finger at Bayern's players. "They got him sent off, there's no doubt about that," he said. "After that they had control of the ball that they never had all night," he added. Olympique Lyon reached the Champions League semi-finals for the first time despite losing 1-0 at French rivals Girondins Bordeaux on Wednesday. Ligue 1 champions Bordeaux had only an outside chance of qualifying after going down 3-1 in Lyon last week but Morocco striker Marouane Chamakh kept their hopes alive by scoring from close range just before the break. Lyon, though, controlled much of a highly-tactical affair that was not as exciting as the first leg to triumph 3-2 on aggregate. Bordeaux went close to a second goal on the night that would taken them through when a late Wendel header produced an excellent save from Lloris, who also played brilliantly in the first leg and in the previous round against Real Madrid. "It came down to detail," Puel told reporters. "Then there was that match point for Bordeaux (Wendel's header) and Hugo saved it for us. "Hugo came up with the save we needed, once again. 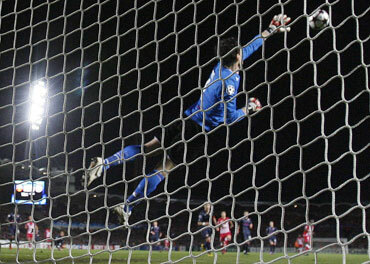 With such a great goalkeeper you can go places," he added.